Quick Clean Laundromat: How to use a Laundromat? 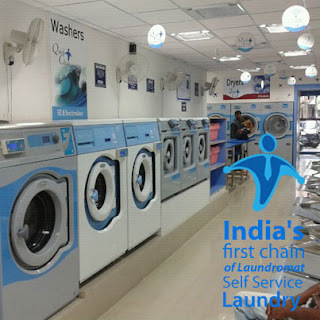 India's first chain of laundromat " Self service laundry "
How to use a Laundromat? Whether you find yourself needing to use a Laundromat for regular laundry needs every week or only once in a while to wash something extra bulky or large, there are a few things to do to make sure that your Laundromat trips are a success. Learn how to use a Laundromat and come home with clean and sweet smelling clothes. 1. Sort your clothing before you leave home. Organize your dirty laundry into the loads you will be washing and place the loads of laundry that will be washed into separate containers or bags for transporting. Check pockets and sort them into three bags: whites, bright colors and darks. You may use laundry baskets or garbage bags to transport. 3. Haul your laundry to your selected machines and open the washer. 4. Read any specific instructions for operating the washers to completely familiarize yourself with the use and operation of the washers. 5. Load your dirty laundry into the washers according to your loads that you previously separated. Close the washers and add the necessary detergent. Select the water temperature and washing cycle desired (cotton, permanent press, delicate, etc.). 6. Swipe the smart card to start the washer / Place the necessary coins into the washer.. Note the length of the washing cycle to know when the cycle will be over. 7. Find a chair and keep yourself busy with whatever you brought to occupy yourself while you wait. Access the free wifi, chat with friends, have some coffee or watch T.V. 8. Remove your washed clothing when the washing machine cycles have finished. Transfer the wet clothes back to the baskets available at Laundromat and find available dryers. 9. Load your wet laundry into the dryers you cleaned and prepared, along with a dryer sheet if you use them. Select your drying heat level and place the smart card / necessary coins into the dryer. Make sure each dryer begins to operate. Note the length of time the dryers will run. 10. Check your clothes in the dryers as the time when they will be finished gets close. Determine whether you will need to add more coins for longer drying times or whether your clothes will be sufficiently dried. Add more coins if necessary. 11. Remove your clothing when everything has dried. Fold each item of clothing as you remove it from the dryer and place directly into your container for transporting the laundry. Still have confusions/questions? Our store manager will be happy to help you! Sounds easy? Do visit a Quick Clean Laundromat near you to have a superior hassle free laundry experience. Click here http://www.quickcleanindia.com/ to know more about us. Established in 2010, Quick Clean Private Ltd is the 1st company to introduce the concept of Laundromats, self-service laundry, in India. With chain of Laundromats across India, Quick Clean is already making waves and providing a hygienic, clean and economical laundry solution to people in several parts of the country. Quick Clean Laundromat is a concept where any soiled / stained laundry can be washed and 100% dried in a clean & hygienic environment in just an hour. What makes us unique is we provide our customers with the services they desire and deserve; high quality "state of the art" Electrolux Professional Laundry equipment, personal assistance, "wash & fold" drop off service, air conditioned environment and assortment of entertainment options. Quick Clean has already marked its strong presence in Delhi NCR with 11 outlets and is reaching to other parts of the country strategically. Click here http://www.quickcleanindia.com to know more about us.